What Is Ostrich Meat, and How Is It Used? Instead of being similar to poultry, ostrich is a red meat much more like beef in taste and texture. Ostrich meat has great versatility and can be bought ground, cut into steaks, as sausage, and even hot dogs. Ostrich can be substituted for most any meat and grills very much like lean beef. Ostrich is a large flightless bird that can weigh in at up to 250 pounds and stand 7 feet tall. Most of the meat is found on the thigh and hindquarter of the ostrich, with lesser amounts on the forequarter. As it is very lean meat, it can be tough if cooked too long. Because of the limited quantity in production as compared to beef, poultry, and pork, it is relatively expensive. Ostrich meat is leaner than most any meat you will cook. Because it is so lean you will see a lot less shrinkage during cooking and you won't have to drain away fat after cooking ground ostrich. You can fry or grill ostrich steaks as you would beef. Be sure not to overcook ostrich and use marinades for steaks to hold in the moisture when it cooks. Ostrich absorbs flavors more quickly than beef so you might want to reduce marinating times and limit the number of spices you use. Ostrich should be cooked to a temperature of 150 F for medium doneness, while 125 F is enough for rare. The cooking times for ostrich are about the same as beef, about four minutes per side for medium doneness, but keep a close eye on it. Ostrich is higher in iron than beef so it has a very red color to it, even when it is properly cooked. Don't compare the color with cooked beef when determining if the meat is cooked properly. It will be darker red when done. This is why it is best to use a meat thermometer to check for doneness. What Does Ostrich Taste Like? Ostrich is usually described as tasting like beef, but not as robust in flavor. Thus, it is generally well-liked by picky eaters who normally shun game meat. Some even think it is bland, so it benefits from marinades and seasonings. Pick an inexpensive cut the first time you try it so that you can get used to the cooking process and the flavor of the meat. It is easy to replace beef with ostrich steaks and burgers for any grilling occasion. You can especially use ostrich for recipes that call for marinating the meat. The availability of ostrich meat is still rather spotty, but with new ostrich ranches popping up, it is getting easier to find. Because it is leaner and lower in cholesterol than most red meat, ostrich is frequently found in health food stores and gourmet grocers. Online outlets carry ostrich, so you can have it shipped practically anywhere. Ostrich is usually available as steaks and as ground meat. It is far easier to find it frozen rather than fresh, unless an ostrich farm in your area supplies a specialty grocer or butcher. Ostriches are tolerant of a wide range of climates, so the availability depends more on a rancher choosing to raise them rather than geographic location. Keep frozen ostrich steaks and ground meat in the freezer in airtight wrap until you are ready to use it. If you take it out of the freezer and place it in the refrigerator to thaw, use the meat within 10 days. 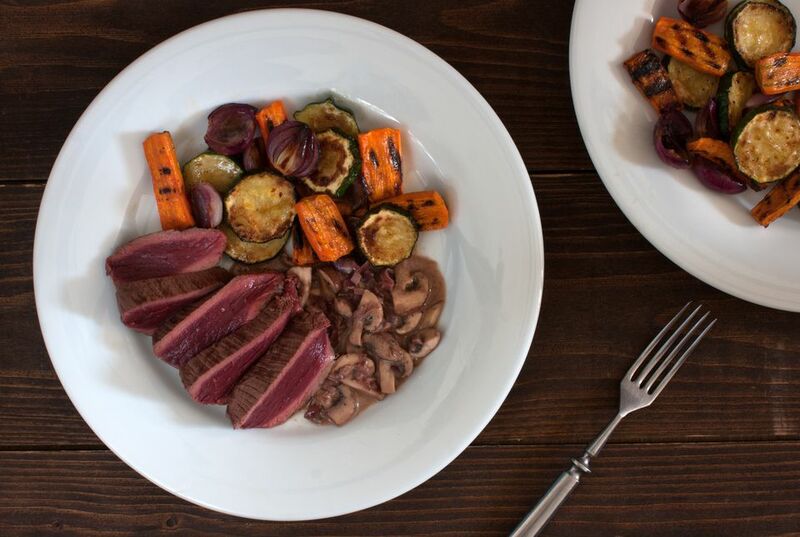 Ostrich meat is a great way to reduce your fat and cholesterol intake while still giving you a red-meat meal. A 3.5-ounce (100-gram) serving of ostrich meat has 116 calories, 2.4 grams fat (only 0.8 grams saturated fat), 71 micrograms of cholesterol, and 22 grams of protein. It also provides 20 percent of your daily need for iron and is rich in vitamin B12, B6, niacin, pantothenic acid, riboflavin, thiamin, phosphorus, selenium, and zinc. Ostrich meat is often sought by people who have developed an alpha-gal allergy to mammalian meat, which can develop after a tick bite. It is also compatible with the paleo diet. As for dietary restrictions, ostrich is not a kosher meat. Have You Ever Made an Ostrich Burger?